Signed and dated lower left: "bluhm '78"
Signed, dated, and titled verso: "bluhm / '70 / 'JUNO'"
Signed, dated, and titled verso: "bluhm / 70 / OPIS"
Signed, dated, and titled verso: "bluhm / 70 / 'NIOBE'"
Signed and dated lower left: "bluhm / '71"
Signed and dated lower right: "bluhm / '74"
Signed and dated verso: "bluhm / '74"
Signed and dated lower left: "bluhm / '76"
Signed and dated verso: "bluhm / '76"
Signed and dated lower right: "bluhm / '76"
Signed and dated lower right: "bluhm / '78"
Hollis Taggart is pleased to announce representation of the Estate of Norman Bluhm, Abstract Expressionist painter (1921-1999). From his early richly-layered canvases to his more structured and vibrant later works, Bluhm’s paintings are recognized for their compelling evocations of movement and energy. To mark the new collaboration, Hollis Taggart will present an exhibition focused on Bluhm’s work from the 1970s at its primary Chelsea location at 521 W. 26th Street, opening on March 14, 2019. The exhibition, Norman Bluhm: The ‘70s, will be accompanied by an essay by the poet and art critic John Yau, a long-time friend and advocate of Bluhm’s work. Bluhm studied architecture at the Armour Institute of Technology (now the Illinois Institute of Technology) under Mies van der Rohe. Two weeks after Pearl Harbor in 1941, he enlisted in the United States Army Air Corps and served as a B-26 pilot in World War II. Returning from war, and no longer interested in architecture, Bluhm briefly studied fresco painting in Florence. In 1947, he moved to Paris to study at the Académie de la Grande Chaumière and the École des Beaux Arts under the G.I. Bill. 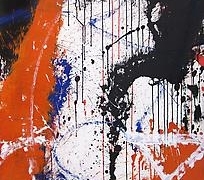 While in Paris he formed relationships with a wide range of artists, including Alberto Giacometti, Antonin Artaud, Sam Francis, Jean Paul Riopelle, and Joan Mitchell, and began following his own artistic path. In 1950, he married Claude Souvrain, a French national who was herself a creative spirit. His early work in Paris consisted mostly of delicate line drawings, depicting still lives, cathedrals, rooftops, nudes and gestural semi-abstract heads. In the early 50s, he began layering watercolors to create abstract landscapes and seascapes, and worked with oil on canvas when he could afford it. In 1956, with little left following the end of his marriage, Bluhm moved to New York. The following year, he held his first solo exhibition at Leo Castelli Gallery. During the late 1950s and into the 1960s, Bluhm showed extensively in solo and group exhibitions in the U.S. and abroad, and continued to experiment and push the boundaries of free-form expression within his work. In 1961, he married his second wife, Cary. Over the next three decades, Bluhm’s work would go through several critical transformations. In the 1970s, the female form would come to dominate his aesthetic. Strong curving lines and organic forms coalesced with flat fields of color, ranging from bright violets and pinks to vibrant reds and blues. The mixture of color and form, along with a flattening of the surface plane, produced strong sensations of movement, suggesting in some instances a figure in the throes of metamorphosis and in others a violent collision of elements. “While Bluhm’s earlier works may be better known—perhaps because of their greater visual affinity to Abstract Expressionism—it is these powerful works of the 1970s that capture in particular Bluhm’s tremendous creative vision and capacity. For our first solo presentation of his work, it seemed fitting that we highlight the aesthetic and conceptual impact and quality of these mid-career paintings,” Taggart added. In 1969, Bluhm and his family left New York City, and a year later settled in Millbrook, NY, where they spent the next decade. Pop Art and the social networking of the New York art world pushed him further from the epicenters of activity and some of the acclaim his contemporaries achieved. He continued to show work throughout his life, however, and was especially respected in Europe where the tradition of painting remained important. In the 1980s and 1990s, Bluhm continued to innovate. He incorporated decorative motifs and references to Asian and Indian art in his large-scale triptychs and multi-panel paintings. The last decade of his life he spent in Vermont. His steadfast commitment to gestural and expressive painting remained, and was now reincarnated within an architectural structure. With every transition in his work he elevated the experience of emotion, spirituality, and passion inherent to his nature. 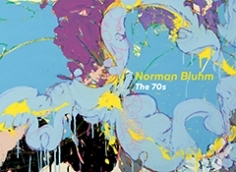 For more information about Norman Bluhm: The '70s, please contact us at info@hollistaggart.com or 212.628.4000. For press inquiries, please contact Alina Sumajin or Sascha Freudenheim, PAVE Communications & Consulting at alina@paveconsult.com, 646.369.2050 or sascha@paveconsult.com, 917.544.6057.